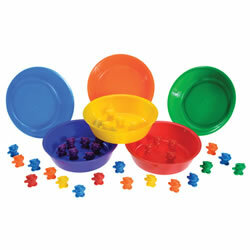 Kaplan offers colorful aids and activities to support young learners' sorting and patterning skills. 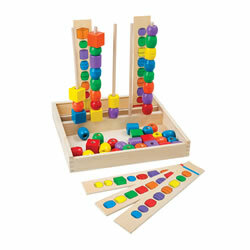 Kaplan offers sorting sets, block sets, mosaics, stacking activities, flash cards, pegboards, and more. 3 - 7 years. 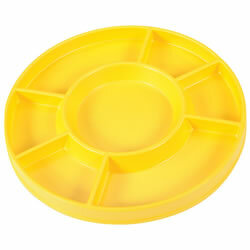 Customize your center time by combining this sorting tray with counters from popular classroom themes. (Counters sold separately). 2 years & up. 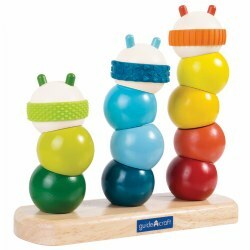 Stack, match, and explore the sense of touch with this caterpillar-themed stacker. It is made up of colorful, rounded, chunky, tactile shapes that fit on a pegged base that allows for stacking multiple angled, color-coded blocks. 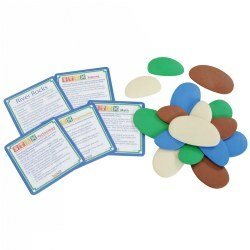 Set includes color-matching activity cards and card stand for sequencing activities. 3 years & up. These colorful Jumping Jacks come in five colors and three different poses for endless sorting, patterning, and matching possibilities. 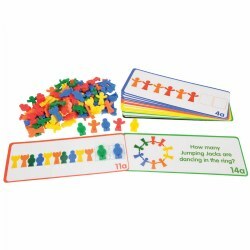 A set of 16 double-sided pattern activity cards, 105 jumping jacks, and a storage container are all included in this fun and engaging set. 3 years & up. Bears introduce matching, math skills, color recognition, and logical thinking skills. 6 bowls and 102 teddy bears included. Bowls: 6" diameter x 1" deep. 18 months & up. 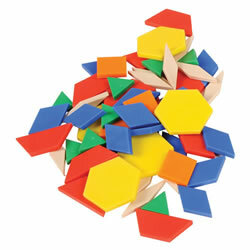 This colorful set of 24 Pop 'Em Shapes provides multiple learning experiences for children. The vibrant pieces introduce six colors to enhance color recognition and the shapes printed on each piece allow for the identification of six basic shapes. Fine motor skills are enhanced as children push the pieces together and pull them apart. The learning continues as children sort and match the pieces by shape and color attributes. 3 years & up. Time to Block the Clock! Combines shape sorting and learning to tell time. It's two toys in one. 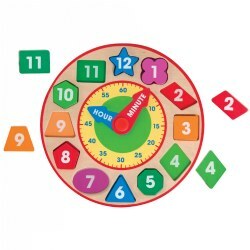 Place the colorful numbered shape pieces in their proper places on the face of the soundly built clock and move the hour and minute hands to make learning time fun! Styles may vary. 1 year & up. Stack the shapes on opposite ends of the see-saw to create a balanced platform. Shapes fit snugly in routed holes. 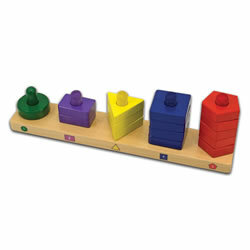 Promotes color and shape recognition, balancing, color-matching, and sequencing. Sturdy wooden construction with rounded corners and smooth edges. Safe non-toxic paints with a clear finish. Even young children get in on the fun of creating and matching patterns and designs with these thick, wooden geometric blocks in six brilliant colors. Set includes 32 pieces in a work tray and 20 parquetry pattern cards. 3 years & up. 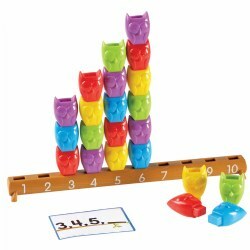 Stack the owls to match the numbers (1-10) on the branch to build early counting skills, one-to-one correspondence, color identification, sorting and patterning, and much more! Includes 25 stacking owls, one branch, spinner, and 10 activity cards. Owls measure 1 3/4"H; branch measures 13 1/4"L.
3 years & up. Help little hands get a grip! 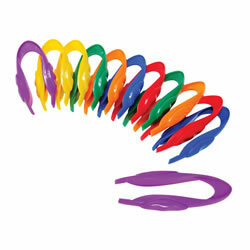 The key to fine motor skills is developing the thumb-forefinger pincer grasp. Feature ergonomic depressions to guide proper grip. Use with manipulatives or other small objects. Perfect for teachers, specialists and occupational therapists. Also a great early science tool. Set of 12 - 6" long tweezers. 2 each of 6 colors. Guide included with suggested activities. 3 years & up. Develops shape-recognition and spatial relations. Features 10 simply designed, colorful patterns, and 45 pattern blocks in 6 different shapes and colors for replicating each pattern. Stores neatly in wooden case. 3 years & up. 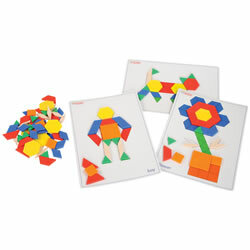 This attribute set develops shape recognition and spatial relations. 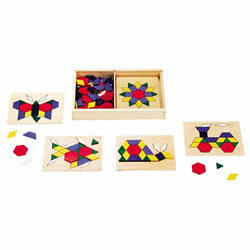 Includes 10 designs on wooden cards with over 100 pattern blocks in 6 different shapes and colors which replicate the patterns. Stores neatly in a durable wooden case that measures 13" x 9" x 2". 3 years & up. 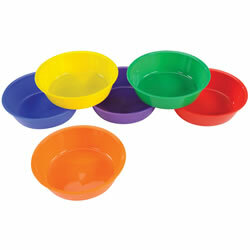 Six colorful bowls are great for sorting and color recognition. 6" diameter x 1" deep. 3 years & up. 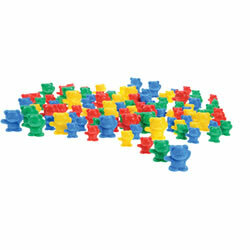 Make counting and matching colors more fun with plastic bears in 3 sizes and 4 colors. 1-1 1/2" tall. 80 bears: 20 papas, 20 mamas, and 40 babies. 3 years & up. 250 multicolored plastic blocks in 6 shapes and colors provide problem solving challenges while building color, design and patterning skills. 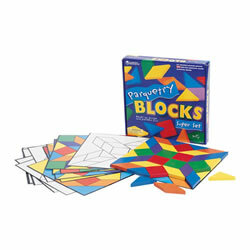 Set includes 20 double-sided picture cards with two levels of difficulty and 250 blocks in plastic storage container. 2 years & up. Kids will enjoy this 'sort' of fun! 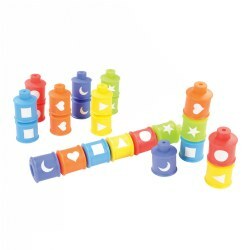 This 15 piece wooden set will engage children for hours counting and matching shapes, colors and sizes to the durable, solid-wood base, which provides a matching key. Measures approximately 14" x 5 1/2" x 4". 3 years & up. 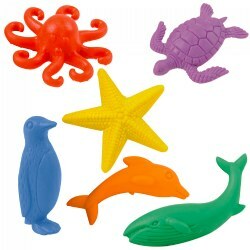 14 different sea creature counters in six different colors. Includes a starfish, penguin, turtle, frog, lobster, stingray, dolphin, whale, shark, seahorse, seal, crab, octopus, and ocean fish. Includes 84 counters. 5 years & up. Includes six sets of 28 wooden dominoes for a total of 168 pieces. 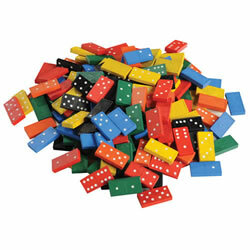 Dominoes come in a variety of vibrant colors that make play more exciting. 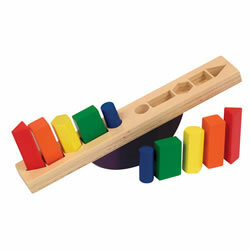 Stack them, match them, set them up and knock them over again and again for hours of fun. Pieces store in a convenient jar with screw-on lid and handle. Grades K & up. 250 multicolored plastic blocks in 6 shapes and colors provide problem solving challenges while building color, design and patterning skills. Includes a handy plastic storage bucket! 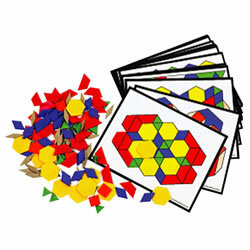 Also includes 36 plastic activity cards. 3 years & up. 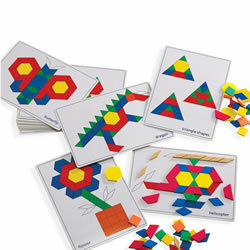 Practice matching skills and introduce geometric shapes with this set of pattern block cards. Includes 20 double-sided cards with 2 levels of difficulty. Cards measure 11 3/4" x 8 1/4". Pattern blocks sold separately. 3 years & up. Match the shapes and fill the spaces on five double-sided, recessed, wooden boards with ten irresistible animal designs. 55 geometric shapes are included to complete the pictures. 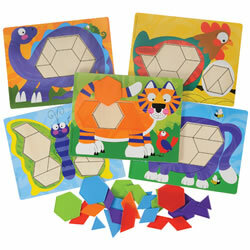 Have fun while developing shape and color recognition, fine motor and language skills! Boards measure 8 1/4"H x 11"W x 1/4"D.
3 years & up. These cubes are great for early math skills! 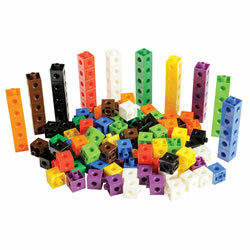 Set includes 150 cubes in ten different colors that snap together and measure 2cm each. Pieces store in a convenient jar with screw-on lid and handle. 3 years & up. 250 multicolored plastic blocks in 6 shapes and colors provide problem solving challenges while building color, design and patterning skills. Includes a handy plastic storage container!